You can't make anything go anywhere. It just happens. 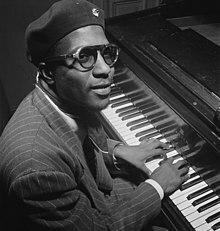 Thelonious Monk (10 October 1917 – 17 February 1982) was a jazz pianist and composer. I don't know where it's going. Maybe it's going to hell. You can't make anything go anywhere. It just happens. Working with Monk brought me close to a musical architect of the highest order. I felt I learned from him in every way — through the senses, theoretically, technically. I would talk to Monk about musical problems, and he would sit at the piano and show me the answers just by playing them. I could watch him play and find out the things I wanted to know. Also, I could see a lot of things that I didn't know about at all. This page was last edited on 9 December 2018, at 19:44.